Bill said: "The Lion Bookshop has been a feature in Rome for 50 years, according to their website - well, I know it was there 30+ years ago when I was a 19-year-old university student in Rome. As there were limited publications in Italy in English in those days, we all grew to know the place...in fact, because of the expense of shipping books from the States, for some classes (like English Lit), the instructor would just tell us to go over to the Lion and buy a used copy (which we sold back to the Lion at the end of the semester)." 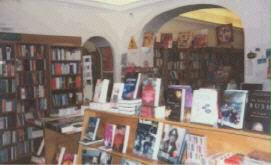 The offer of this bookstore consists of more than 30 000 titles from both fiction and non-fiction. The bookstore is known for its well-stocked children’s section. Besides the wide selection of contemporary and classic fiction, you can find books on Rome and Italy in general, art, architecture, cooking, and a special section with all sorts of books focused on English as a foreign language. Yes, the Lion Bookshop is still there… Established in 1947, it’s the oldest English-language bookstore in Rome and in the whole of Italy. A small café serving American cookies, cakes and bagels has been added to the store. Located in the center of Rome, a 10 minute walk from the famous Spanish steps or from Piazza del Popolo in a small side street Via dei Greci.